The faded images in Tennessee's Cumberland Plateau are believed to be the most widespread collection of such art ever found in the U.S. 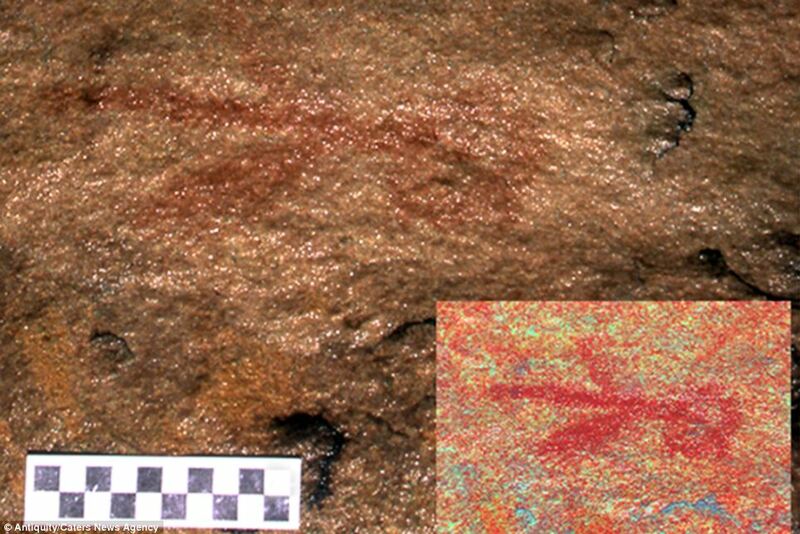 Recently archaeologists have discovered America's oldest cave and rock art that has remained hidden for more than 6,000 years in Tennessee. The faded images were found in Tennessee's Cumberland Plateau and they are believed to be the most widespread collection of such art ever found in the U.S. Cumberland Plateau contains 280 caves - 21 of which are described as 'extensive' in size. Researchers claim there are 71 known prehistoric cave art sites in the greater south-eastern USA. The preserved artworks were found by researchers Jan Simek, Alan Cressler, Nicholas Herrmann and Sarah Sherwood from the Department of Anthropology at the University of Tennessee and Mississippi State University. The researchers state that some of the pictures found remain extremely fragile because they were drawn into mud. Researcher Nicholas Herrmann noted that, "Human images are often shown in activities suggesting heroic or ceremonial action, flying, transforming into animal shapes or reaching through the rock surface." Rock art is commonly thought to have been drawn by Native Americans and other races as part of rituals and ceremonies. Mud was also traditionally used by Native Americans in the south east part of the country because it was readily available and was seen as an ideal canvas by prehistoric cave artists. The images found vary in that some of the pictures were drawn using shallow lines made with a pointed tool. This type of art shows events such as hunting, or depicts animals that the Native Americans would have lived with and eaten. Other images are more elaborate, depicting mythical creatures and representing the Native's spiritual beliefs. Some also were drawings of canids such as wild dog-like creatures that included wolves, foxes and jackals. Other animal images, such as quadrupeds and reptiles, are rare in open air art work but commonly found in dark cave settings. 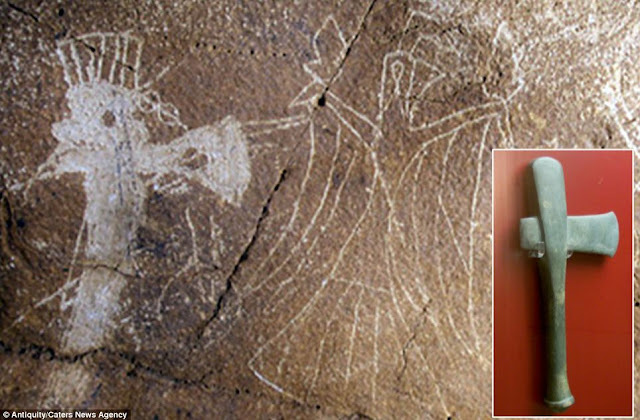 Anthropomorphs are also depicted in petroglyphs and are one of the most common elements seen in caves. These images appeared first during the Archaic period. Woodland period sites also contain human images. 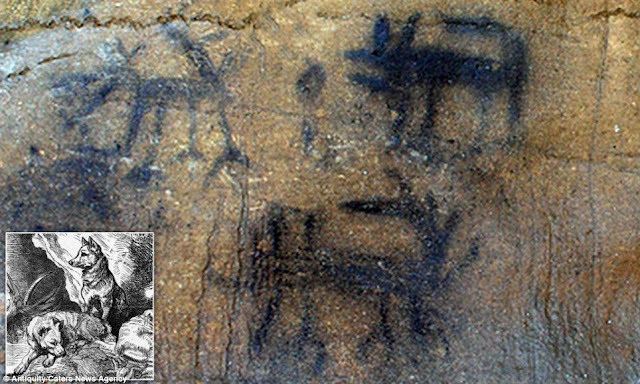 The researchers have concluded that both open air and cave art sites in Tennessee share a central theme of human imagery. Circles are also common in the open rock art sites. 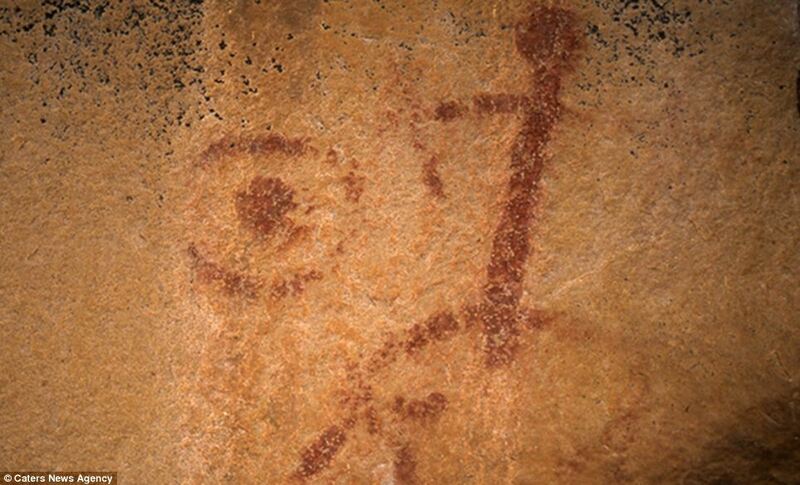 These include ‘sun’ pictographs and concentric circle petroglyphs. In at least three cases they are associated with falling water. Circles can also occur in the open with anthropomorphs. Other common motifs in both caves and open air sites are grooves and curving lines. In the open air, these are often produced by a pit and groove technique in soft sandstone and are frequently found in sites that also contain realistic motifs. The researchers found that in contrast, 'birds are among the most frequent depictions in dark zone cave art. 'Frequently, although not exclusively, birds inside caves are depicted in flight,with their wings extended and flight feathers clearly delineated. The common presence of birds inside caves, but not in the open air sites, is perplexing if birds are creatures associated with the upper or celestial world, as has been interpreted by south-eastern archaeologists. 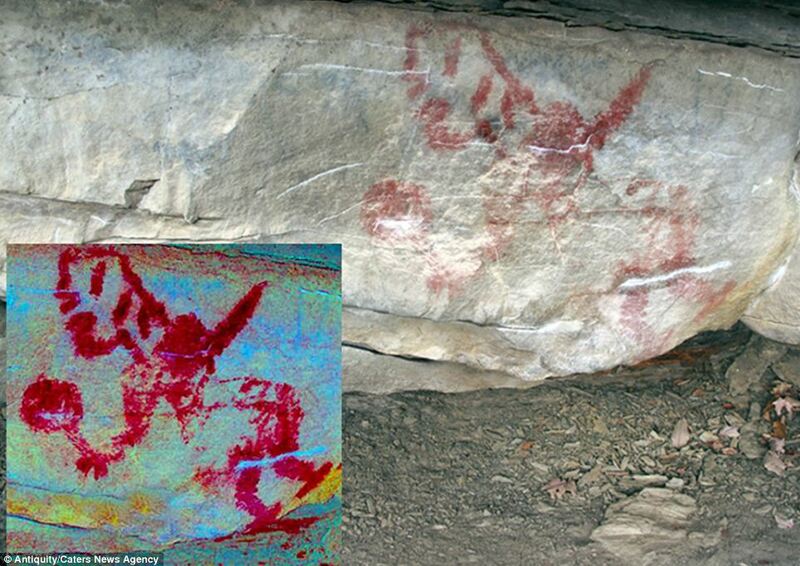 The drawings discovered in Tennessee are believed to represent the Native American's prehistoric world in three dimensions - the upper parts of the art are 'celestial' representing religious beliefs. The middle sections usually show plants, animals and the world in which they would have live. Art that is found in the lower parts of the caves and walls represent 'darkness, death and danger'. It is known that people came to the Plateau to find specific foods, including animals and plants and to obtain non-food resources. Rock art was an integral part of how people conceived and used their landscapes. Responses to "Ancient Cave Art that was hidden for more than 6,000 years was found in Tennessee (Photos)"
looks like they had shoes of some sort, too...from looking at the last pic. Thank you so much for sending this article along to all of us. If only we were as smart as these people so long ago. If only we left pictures in stone for our children and others to see in the eons ahead. I loved this article so much. 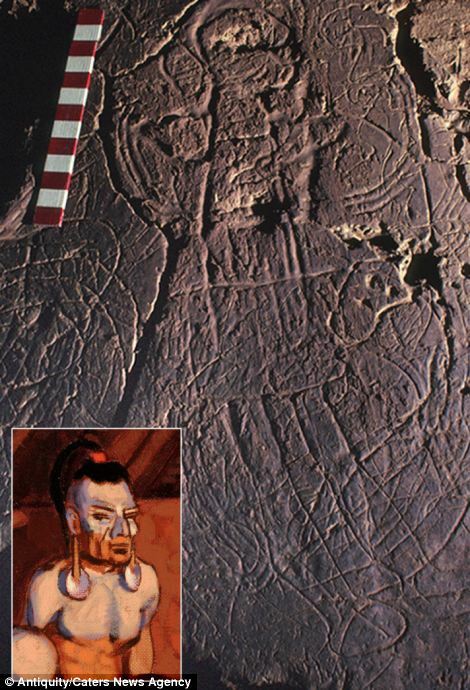 We have here in Powell County, KY, on the western edge of the plateau, perhaps the most complex rock art in the E. U. S. A face image with the hint of a connection to Central America and the Aztecs. I'll send you a booklet with explanation and images if you provide an address. alancornette@bmail.com Al C.
6,000 years ago and that art in the rocks, hmm so they discovered America 5,500 years before Colombus. tom Watson, they are letters. 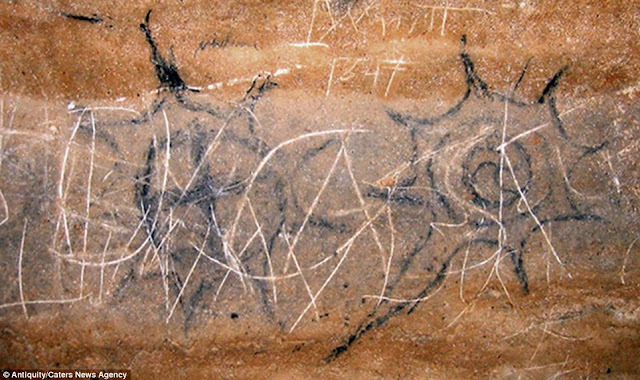 Historic graffiti superimposed over the ancient art in recent times. Interesting that depictions of dogs most-closely resemble the Carolina Dog, which would have lived alongside these ancient people. Wolves and foxes don't carry their tails up over their backs like that, and of course, jackals aren't found in North America at all.